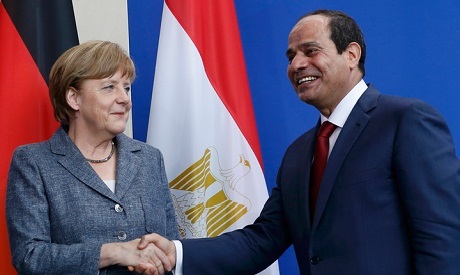 Egypt's President Abdel-Fattah El Sisi received on Monday a telephone call from German Chancellor Angela Merkel where they discussed a number of regional issues including the situations in Libya and Sudan, according presidential spokesman Bassam Rady. President El-Sisi shed light on the unity and stability of Libya as well as Egypt's support for efforts to combat terror groups and extremist militias, which pose threats not only for Libya but also for the stability and security of the entire Middle East and European countries. Merkel expressed her country's keenness on reaching a political solution to the Libyan crisis with a dialogue between the Libyan parties and stressed the importance stepping up efforts to end the deterioration of conditions in the Arab country. President El-Sisi also asserted that Egypt is closely following up on the conditions in Sudan, pointing out that Egypt backs the choices of the Sudanese people without interference in the African country's internal affairs. Merkel expressed her keenness on developing cooperation with Egypt in various domains, while the president said he looks forward to continuing joint efforts to cement the two countries' relations.